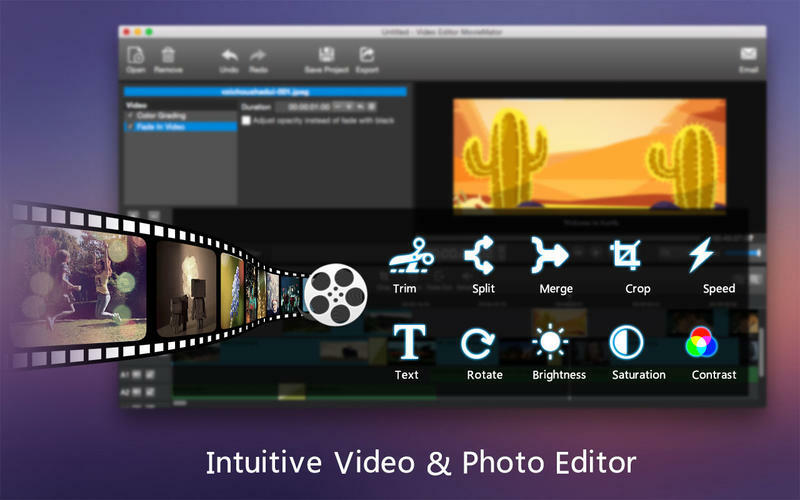 Video Editor MovieMator is committed to providing the most intuitive and easiest way for video editing. Real-time preview feature ensures what you see is what you get, and even video editing beginners can quickly get started and freely edit videos as they want. Making movies has never been easier! It fully supports all media formats like 4K UltraHD, H.265, MP3, OGG, JPG, SVG, etc. and optimizes for the decoding of different formats, which significantly improved the decoding speed and quality. 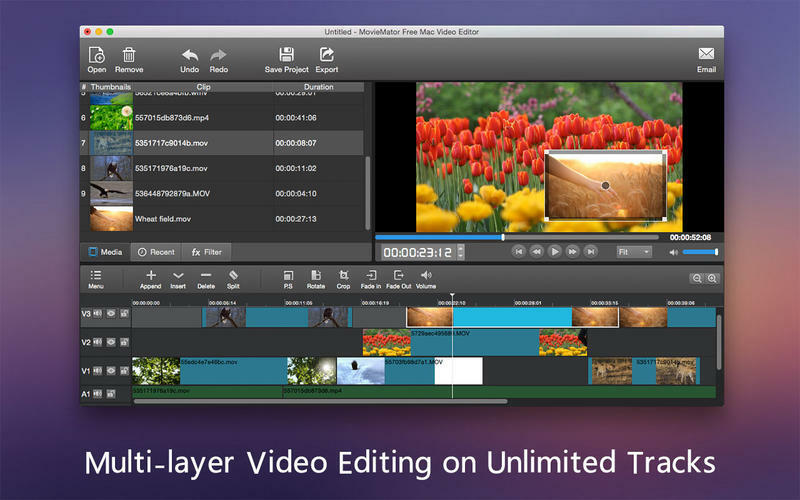 Unlimited video tracks and audio tracks help users handle all projects. Switch the visibility of the current track to easily preview specific track elements. Trim / Merge / Split / Crop / Rotate video clips of any format. Support volume adjustment and various audio filters to create perfect sound effect. Create Fast/Slow-motion video by adjusting the playing speed as you like. Set fade in/out time for videos and audios with freedom. 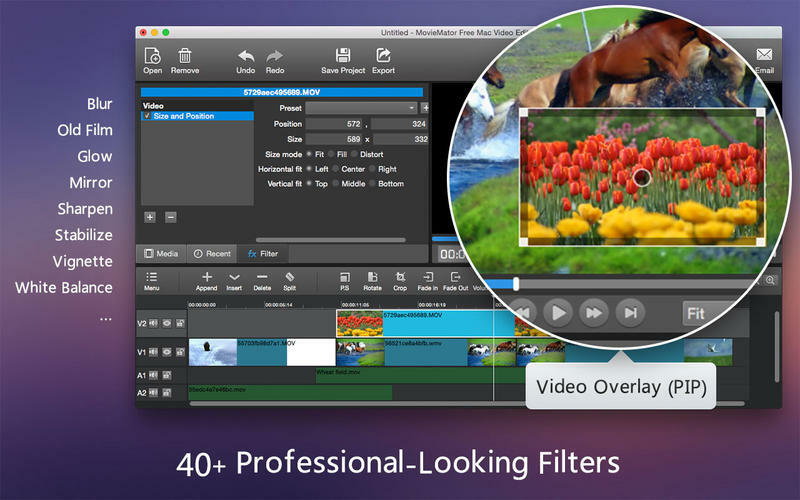 Make your work more professional and personalized with Picture-in-picture and other Hollywood-level effects. Customize the content/color/size/position of text to create personalized subtitles. Mute the original audio with one-click to easily change the background music of videos. Precise control over all video, audio and image frame by frame. Import all videos/photos shot by iPhone 6s, GoPro, camcorder or other devices. Support videos/images downloaded from Facebook, Instagram, Flickr and more sites. Support videos with voiceover that recorded by any screen recording software. Work natively with a broad range of formats including ProRes, RED, XAVC, AVCHD, H.264 from DSLR and more. The interface of MovieMator is intuitive and all features are clear at a glance. Easy-to-use cut, copy, and paste operations. Hide, mute, and lock video track and audio track with one-click. Arrange and Trim all elements (videos/audios/images) on the timeline by dragging and dropping. Real-time preview feature ensures what you see is what you get. Incredibly fast export of HD videos in 200+ media formats for playback on all devices. Customize output parameters like resolution, frame rate, aspect ratio, encoding and etc. Save the file as a project for direct editing next time. Auto save the project when the window is closed unexpectedly.